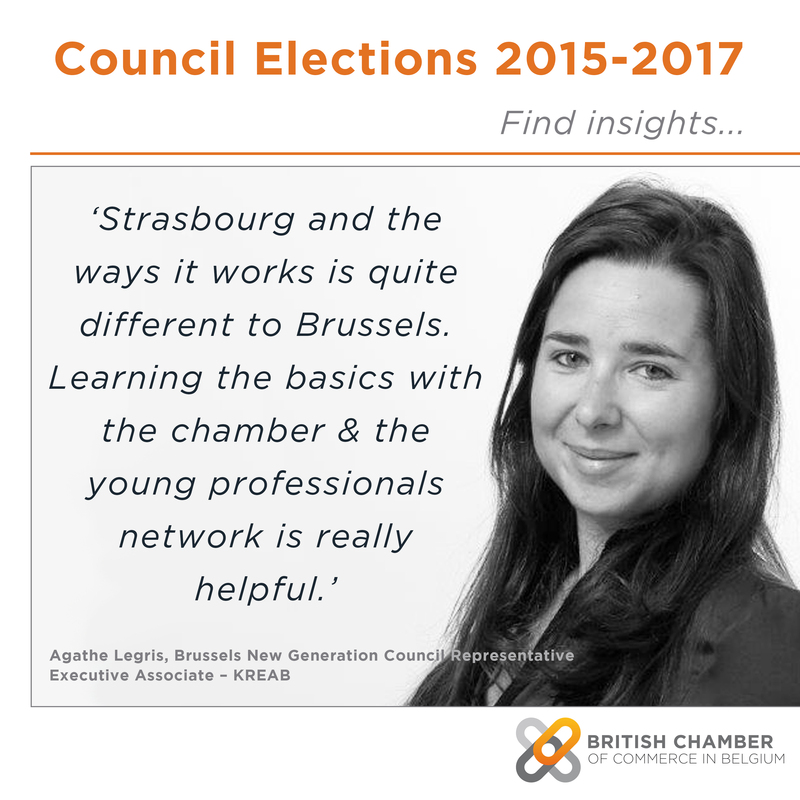 Agathe Legris is the Council representative for the British Chamber’s young professional network, Brussels New Generation (BNG). After joining the Council last September, Agathe discusses the importance of being a member of the Council and how it has benefitted not only her bu the BNG too. For more information on the Council nominations process and timeline, please follow this link. If you’re interested but want to know more about being a Council member, or standing for President, contact Glenn for an informal discussion. My real relationship with the British Chamber started in May 2012 when I became a member of the Brussels New Generation Core Group. I already attended events and meetings at the chamber before this but I really became involved once joining the BNG. The importance of the chamber and the BNG in particular, is that it allowed me to access a broad network; ranging from young professionals coming to similar events, to meeting MEPs and their assistants. It helped me to have access to the parliament which is really important for my work. I wanted to get actively involved because, I was given the possibility to plan and organise events which, as well as working as a consultant for KREAB, gave me the possibility to further develop and strengthen my communication skills and to also work for another organisation. Since my time here, the chamber has really improved its communication to its members, especially its social media. When I first heard of the chamber five years ago, there was very little online presence and not using the tools to the best of their ability. It has become a real asset to the chamber now. I have also seen great progress happen with the BNG, especially since the new core group was elected last year. Throughout the last 3 years, the BNG has become more active and involved within the chamber’s activities – I think that is also because the British Chamber itself has seen the benefits that the BNG can bring to the chamber. I have two favourite memories since being an active member of the chamber. The first would have to be the BNG Annual Visit to Strasbourg. It was really interesting for me as a young professional, but also for my everyday work as a consultant. Strasbourg and the ways it works is quite different to Brussels. Learning the basics with the chamber & the young professionals network is really helpful: from knowing where the entrances are to knowing how and where to meet MEPs and their assistants. It also gives other insights that you wouldn’t get in Brussels either; it’s a really helpful initiative, especially if you know that you have to bring your clients there in the future. The second would be joining the board in September. The British Chamber is a great network, besides the quarterly cocktails, the network of people who volunteer to help with the running of the chamber is also very important. Being a part of the Council has enabled me to extend my network to people who are more experienced in public affairs and I get to learn a lot more than just what I would learn at events and other networking events the British Chamber organises; not only does it give your company visibility, but it also gives you as a person visibility too. It is also great for me to be a part of the Council because I am the BNG Core Group’s representative and I get to see how the BNG can fit into the everyday chamber activities, and also demonstrate the significance of this young professional network. The Council can really see, through me, how much the BNG group has progressed and promises to progress in the future.